Ellis (Tye Sheridan) is 14-years-old. He lives on a houseboat on the banks of a country river in Arkansas with his parents Mary Lee (Sarah Paulson) and Senior (Ray McKinnon). He has a crush on 16-year-old High Schooler May Pearl (Bonnie Sturdivant). His best friend Neckbone (Jacob Lofland) scavenges the river with his eccentric uncle Galen (Michael Shannon) for lost treasures the two can rehabilitate and sell. It’s a typical summer for the two boys, typical that is until they hear tell of a gigantic motorboat stranded atop a tree on an island not too far from the mouth of their river. 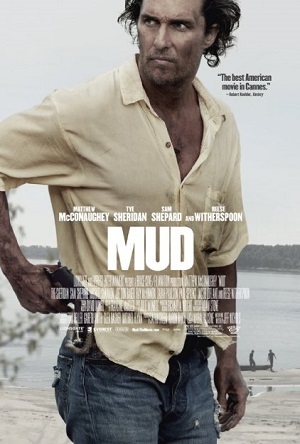 Wanting to claim it as their own, they discover a peculiar, talkative loner calling himself Mud (Matthew McConaughey) living within, spinning a yarn about saving the life of his dearest ladylove Juniper (Reese Witherspoon) and how the two of them will sail away into the sunset together. Ellis wants to believe this stranger for a multitude of reasons, longs to believe that love is as true and as pure as the stories say. Even though he’s warned off by the wizened old man Tom Blankenship (Sam Shepard) living in seclusion on far bank of the river, although it’s apparent Mud is wanted by the police and that Juniper isn’t the angelic devoted woman he has led him to believe, the teen still wants to help, and even if it means putting his own life on the line he’s going to make sure his new friend achieves the deepest desires buried within the confines of his not-so-hardened heart. Mud is the third film from indie darling Jeff Nichols. Like Shotgun Stories and Take Shelter before it, the movie is a character-driven descent into the lives of people who are instantly familiar, individuals you can relate to and understand almost as if you’ve known them your entire life. Also like those two previous efforts, Nichols once again subverts genre convention and slowly goes in directions you don’t always see coming. If his debut was a Hatfield and McCoy descent into familial darkness and his sophomore effort a psychological freak-out combining nature in upheaval and a devoted father slowly losing his marbles, then his third is a coming-of-age drama of faith, understanding and friendship that defies convention resulting in an authentic urgency unique unto itself. The whole movie is seen through Ellis’ eyes and it is his view of the world that anchors the narrative. He sees his parents struggling to keep their marriage intact, he is told that his time living on the river may be coming to an end and he experiences the first throws of an all-consuming crush. Each of these elements weighs on him in almost equal measure, making him question if love exists in the world or if it is nothing more than a fantasy people choose to embrace in order to give their everyday lives momentum and meaning. In Mud he constructs a figurehead to test all of his ideas and constructs, dives into the man’s work in order to prove to himself that love can save the day and heal all wounds. 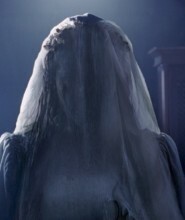 But like all fairy tales the truth is far more complex, and it is the darkness and the dangers surrounding Ellis’ quest that will give him insights he’ll carry with him for the rest of his life. Much like the boys searching for the body of a missing classmate in Stand By Me, the journey is what it is of most importance, not the supposed pot of gold to hopefully be discovered at the end of it, making what happens along the road all the more tender and evocative in the process. McConaughey’s hot streak continues, the actor delivering another strong performance that proves his serpentine, complicated portraits in films as diverse as The Lincoln Lawyer, Killer Joe, Bernie, The Paperboy and Magic Mike were anything but flukes. He makes Mud a fascinating figure, the multifarious layers lurking within this slithery storyteller coming to the forefront in fits and starts, the actor holding his cards as close to the vest as he can. McConaughey has moments of surreal beauty reminding us all why we thought he was going to be ‘The Next Big Thing’ after A Time to Kill, coming into his own during this current stretch of crackerjack performances in ways few would have thought possible beforehand. Yet as great as he is, and he is terrific, none of this would matter if not for Nichols’ faith and trust in his main two child stars Sheridan and Lofland. He allows the duo to disappear inside their roles in ways that defy description, the pair of boys living the film heart and soul instead of roleplaying it out as if they were outsiders dropped into a world they’ve never known beforehand. Sheridan, in particular, dominated my attentions, the youngster having moments of affecting magnificence that brought a lump to my throat and a tear to my eye. Nichols doesn’t get it all right, and there are a few dramatic narrative shortcuts involving Shepard and Witherspoon’s characters that don’t feel anywhere near as authentic as the majority of the rest of the picture does. Additionally, Joe Don Baker and Paul Sparks are more or less wasted as the heavies, and while the pair do have a couple of individual moments where the potential for them to terrify is insidiously insinuated I can’t truly say either of them sent shivers up and down my spine in the way I would have like them to. Finally, the climactic events at Ellis’ home were a little too overblown, and while Nichols stages these explosive last acts with energy and panache they didn’t ring anywhere near as truthfully as the majority of the rest consistently did. Even so, Mud works, plain and simple, everything building to a poetic final set of images that brought a smile to my face while it invigorated my heart with an overall ebullience I could barely contain. McConaughey proves again he’s an actor willing to take chances and dive into even the most unspeakable aspects of a character with a fearless abandon others would be terrified of. As for Nichols, once again he shows he’s a director worthy of the hype and praise continually thrown his way, and as excited as I am about this release that’s nothing compared to my breathless anticipation to discover just what it is he’s got up his cinematic sleeve next.